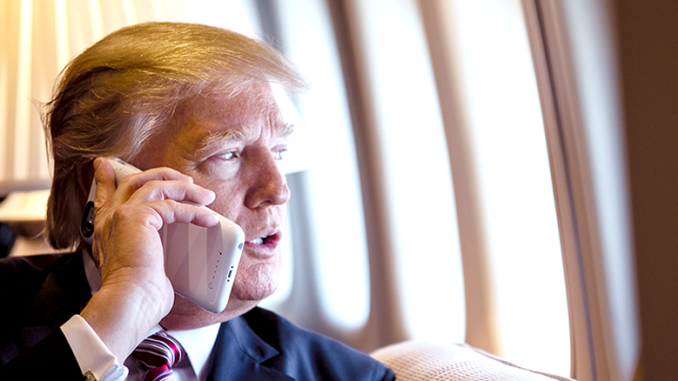 President Donald Trump talks on the phone aboard Air Force One. Official White House Photo by Shealah Craighead. Axios reports that the leak prone Trump administration has experienced yet another embarrassing leak of the president’s schedule, even as the White House launches a search for the culprit. A new set of schedules was leaked to Axios which shows President Trump’s private schedules for four days last week. The leaked schedules, retyped in the format in which West Wing staff receive them in to protect the source, show that 50% of the president’s time was spent in unstructured executive time. The latest breach follows the leaking of three months of the president’s private schedules last week. Those schedules, published by Axios, show that President Trump has spent approximately 60% of his time in Executive Time. Politico reported that the White House, infuriated by the new round of leaks, is aggressively searching for the mole. The internal investigation, approved by acting White House chief of staff Mick Mulvaney and President Trump, is utilizing the IT staff to find the leaker. A Trump official told Politico that they believe the guilty party is not a Trump appointee but rather a career employee at the White House. That source offered no evidence for that belief. The White House aims to not only find and punish the leaker but to also deter leaks in the future with a vigorous probe. The frequent blocks of Executive Time have prompted critics to call the president lazy while his defenders praise his unorthodox methods. Newt Gingrich compared Trump to Winston Churchill. John Kelly, former White House chief of staff, invented the notion of “Executive Time” for Trump, who hates being tied to a schedule. Executive Time has come to include meetings which are kept secret from all but senior most staff, out of fear of leaks. The Trump administration has experienced ongoing leaks for its entire existence and has not yet been able to stop the flow of damaging and embarrassing information. From the leak of a crass and nasty comment about John McCain in a private meeting to a leak of a discussion in a meeting of four individuals with the president to discuss the leak an anonymous and embarrassing editorial in the New York Times to the current embarrassing and bold leaks of the president’s private schedules, the White House has a leak problem. The White House is home to the leader of the free world and how that White House is managed is a clue to the man at the helm. That the President has fostered an environment of chaos, division, and paranoia is not just an embarrassment but a detriment to the nation. A staff that is more concerned about leaking, or being framed by someone who is a leaker, is a staff that is not doing the job that we the people are paying for them to do. Little has changed since then and the leaker, or leakers, do not seem to be deterred by the threat of yet another crackdown.